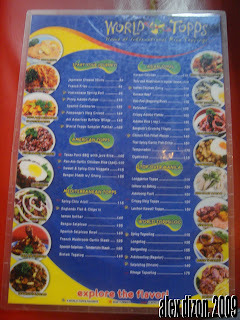 One Pay day Wednesday, I and my officemates Rio and Adie decided to locate a food joint that will fill our angry stomach. Since its payday and we don’t wanna spend our “hard-earned money” on just “some” lunch, so we decided to enter someone else’s building in Makati and get decent lunch in one of their hidden food shops. Our stop, RCBC Plaza. Located at Ayala corner Gil Puyat Avenue here in Makati, believe it or not, this place offers some food shops that will surely fill your hungry stomach even if you are on a tight budget. We dined at World Tops, famous for their sumptuous rice meals with a unique touch from different continents of the world; we took the plunge and tried their delicious offerings. My officemate, Rio, ordered Adobong Pusit. Rice topped with a hot-from-the-stove adobong pusit and a big green pepper and a glass of ripe mango juice. 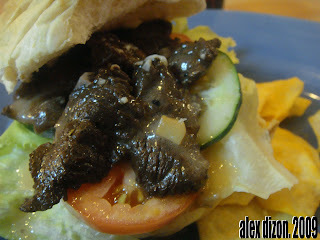 While me and Adie, since we are on a “diet”, we ordered this Saturn’s Ribe-eye Steak Burger with Cheese and a glass of Coke Zero for me and a glass of mango juice for Adie. Honestly, I’m not expecting to be full with my order and I’m not expecting a sumptuous meal since I know that this place is famour for their rice meal. BUT I WAS WRONG. The burger looks nice and yummy from the look of it, and once you sunk your teeth to this mouth-watering burger, you’ll know that you’ve got your tastiest meal of the day, valuing your hard-earned money. The juicy and tenderly cooked steak was matched perfectly with the fresh, crispy TLC (Tomato, Lettuce and Cucumber). The bread, though, I believe was just bought from some bakeshop, is somehow fine. And with the added ingredients like the cheese and dressing, this burger is really good and so yummy! 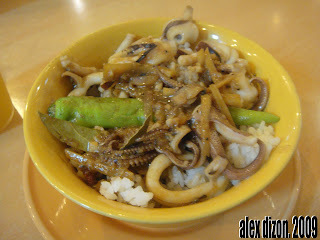 While, Rio, a very slim lady who loves to eat rice, was also satisfied with what she had. The smoking Adobong Pusit smells good. And with the way Rio finished her bowl of this meal, I believe that she had a great experience too dining here. I didn’t expect that with a price like that, you’ll get to taste one scrumptious meal here. 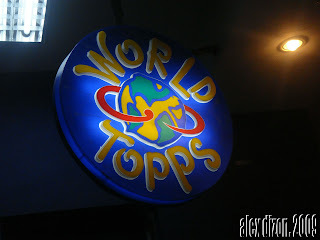 I can proudly say that I had a full stomach and happy pocket after we dined here at World Tops. 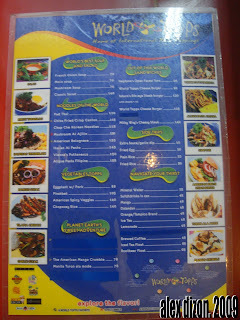 Here's a shot of their menu list. Expect more of my food adventures soon!